An unprecedented salvo of international probes will soon shoot for the Moon, all equipped to signal that a new era of lunar exploration has begun. 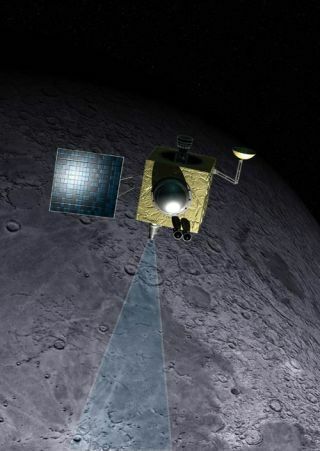 If schedules hold, spacecraft from India, China and Japan will be moonbound before NASA's own Lunar Reconnaissance Orbiter swings into action in 2008. Already on duty, the European Space Agency's SMART-1 is wrapping up its survey work. In the past, having the independent wherewithal to toss a satellite into Earth orbit was a form of space status. That's passe. Times have changed. Now the Moon is where the action is. "I find it both gratifying and exciting." said Paul Spudis, a space scientist at The Johns Hopkins University Applied Physics Laboratory (APL) in Laurel, Maryland. Most countries are flying these lunar missions to "get their feet wet" in planetary exploration, Spudis suggested, with the Moon being close and relatively easy to get to and operate around. "So that happenstance is great good fortune for lunar science," he said. These new data are important to quantitatively analyze the nature and state of potential resources on the Moon, viewed by Spudis as "a critical enabler to permanent human presence." Spudis said that a load of new, high-quality data about the Moon is in the offing. Earth's next door neighbor will be globally mapped with a variety of sensors, including looks at it in wavelengths never before seen from orbit. For instance, a U.S.-built imaging radar will be flown on India's Chandrayaan-1. This APL/U.S. Navy radar experiment will map the scattering properties of the lunar poles, determining the presence and extent of polar ice there, possibly tucked away in sunlight-shy craters. India's Chandrayaan-1 is planned for launch in late 2007-08 from the Satish Dhawan Space Center atop that country's Polar Satellite Launch Vehicle-XL. The satellite will be placed in orbit around the Moon and have a lifetime of two years. Indian scientists and engineers have also designed a deep space antenna system for the country's first spacecraft to Moon. The antenna is scheduled to be erected at a site near Bangalore in Karnataka by end of 2006. When completed, the antenna and related equipment are to represent a world class facility for deep space tracking applications. Payloads for India's lunar orbiter are being supplied by Indian experimenters, as well as from the European Space Agency (ESA), Bulgaria, and the United States. Also, a moon impact probe--which is conceived as a technology forerunner for a future lunar landing mission--is being incorporated. The impactor would carry a high sensitive mass spectrometer, a video camera and a radar altimeter. This device will be released at the beginning of the mission, destined to hit within a predetermined location on the lunar surface. Apart from the video imaging of the landing site, the onboard mass spectrometer will try to detect possible presence of trace gases in the lunar exosphere. Carle Pieters of the Department of Geological Sciences at Brown University in Providence, Rhode Island is the principal investigator for the Moon Mineralogy Mapper (M3) outfitted on Chandrayaan-1. This state-of-the-art imaging spectrometer is provided by NASA/JPL to map the mineral composition of the lunar surface. Pieters is enthusiastic about how the international lunar exploration initiative is proceeding. Although science data has been slow coming out of ESA's SMART-1, "that little mission has kept the Moon in everyone's thoughts," Pieters told SPACE.com. "It has certainly accomplished what it set out to do ... namely, a successful initial technology demonstration at the Moon for ESA." SMART-1 is headed for a controlled impact on the lunar surface in early September. Pieters said that everyone expects the serious remote sensing missions to begin within about a year, starting with Japan's SELenological and ENgineering Explorer (SELENE). India and China will follow. It is too early to know, Pieters noted, whether Chandrayaan-1 or China's Chang'e I will launch first. The U.S. Lunar Reconnaissance Orbiter (LRO) will be the fourth in the group, she said, now eyed for launch in late 2008. "Each of these missions brings its own strength and there is sufficient overlap among instruments to allow healthy cross-calibration," Pieters advised. "Lunar science and exploration will finally have the foundation it needs as 10s...100s of terrabytes of data are returned from all of these missions over the next five years!" Each of the participating nations should and will take pride in their lunar success, Pieters said. "After the first blush of data return--and it has been determined whether water exists at the poles from multiple sources--more serious results will take years to harvest. Here's where the actual competition begins. Those countries that invest most seriously in data analysis will be the real winners," Pieters emphasized. China's bid to become an explorer of the Moon is tied to Chang'e I, a lunar orbiter being prepared for launch next year. According to Luo Ge, deputy director of the China National Space Administration during a recent visit to the United States, Chang'e I is the first step in an ambitious Moon program. Luo stated that China also intends to land a rover on the Moon's surface by 2012, followed by a robotic lunar sample return mission in 2017. Chang'e I would roar skyward from the Xichang Satellite Launch Center in Southwest China's Sichuan Province. The Chinese lunar probe is based on the country's Dongfanghong III satellite platform. China's premier lunar mission will obtain three-dimensional images of the Moon's surface and analyze the content and distribution of useful elements there. Ye Peijian, identified as the chief designer of the country's first lunar orbiter, has been quoted in Chinese press reports that research and development of Chang'e I is moving forward smoothly. To be sent aloft by a Long March 3A rocket, the lunar orbiter is outfitted to perform a one-year mission mapping the moon's surface. Chang'e I reportedly will carry a stereo camera system to chart the lunar surface, an altimeter to measure the distance between the spacecraft and the lunar surface, a gamma/X-ray spectrometer to study the overall composition and radioactive components of the Moon, a microwave radiometer to map the thickness of the lunar regolith, and a system of space environment monitors to collect data on the solar wind and near-lunar region. The SELENE robotic mission to the Moon is tagged by the Japan Aerospace Exploration Agency (JAXA) as the largest lunar mission since the Apollo program. As JAXA's first large lunar explorer, SELENE will be dispatched from Japan's Tanagashima launch site via the H-IIA rocket in the summer of 2007, nominally in August. SELENE consists of a main orbiter and two small sub-satellites that are released in lunar orbit. Nominal observation of the Moon for one year will start after instrument performance checks that span some two months. Making use of 14 science instruments onboard the SELENE satellite, the entire Moon will be surveyed for information on its elemental and mineralogical composition, its geography, its surface and sub-surface structure, the remnant of its magnetic field, and its gravity field. Also being hauled to the Moon is a high definition television camera developed by NHK, tasked to image the Earth observed from the Moon and of the lunar surface. SELENE is to relay "space movies" such as the rising Earth on the lunar horizon. If indeed the launchings of Chinese, Indian, and Japanese lunar probes are successful, the serene Moon will become a bee-hive of activity. Joining in on the action is NASA's Lunar Reconnaissance Orbiter (LRO). NASA's Robotic Lunar Exploration Program (RLEP) has been formulated in response to the President George W. Bush's Vision for Space Exploration. RLEP will execute a series of robotic missions that will pave the way for eventual permanent human presence on the Moon. LRO is first in this series of RLEP missions. Current plans call for its launch in October 2008 and is designed for at least one year of operation. Set to launch with LRO is the Lunar Crater Observation and Sensing Satellite (LCROSS) a bare-bones suicide probe that utilizes cameras and spectrometers to witness its rocket booster's upper stage slam into hydrogen-rich Shackleton Crater before plowing into the lunar landscape itself. With all the robotic traffic hauling all that scientific gear to neighboring Luna over the next few years, could the Moon become, well, over-exposed? "They are more complimentary than they are doubling-up," said Ben Bussey, a lunar expert at APL in Laurel, Maryland. Schedule slips, technical problems, data availability, even launch failures--there's no control over these, he said. "So, yes, maybe we end up with lots of pictures of the same place from different missions. But I think that's better than getting none at all," Bussey told SPACE.com. There's also a central thing to remember, said James Head, professor of planetary geosciences at Brown University. Even with the Apollo lunar samples trucked back from the Moon by astronauts long ago, the armada of robotic spacecraft being readied to rocket there now will be critical to filling in missing details, Head said. "This new wave of spacecraft will be yielding tons of detail ... a baseline for grasping how other planets work," Head said. "The Moon is a keystone to that understanding."